The Raspberry Pi platform has been established as a reliable and, most importantly, low-cost and easy-to-use Linux box. At its launch, nobody could imagine that so many people, from tinkerers to professionals, would find use for it. In the networking space, it didn’t take a long for engineers to put it to work. An excellent article, “Raspberry Pi as a Network Monitoring Node”, was published back in 2013 by Scott Hogg. Companies like NetBeez and Ixia have used Raspberry Pis in enterprise networking products for years now, while Citrix just announced an HDX Ready Raspberry Pi. The Raspberry Pi 3 introduced not only a more powerful 64-bit quad core platform, it also added on-board WiFi and Bluetooth capabilities. Up to that point, wireless connectivity was available only via USB WiFi dongles. The onboard WiFi is certainly convenient and it was a much-requested feature in the broader RPi community. The disappointing issue is that the onboard WiFi is only 2.4 GHz and the ceramic antenna suggests that we shouldn’t have high expectations in terms of performance. In a previous post, I used the Iperf utility to compare performance on the wired interface on the RPi and other single board computers. 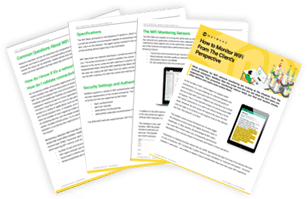 Iperf enables you to send traffic between two endpoints and collect statistics about the network performance. 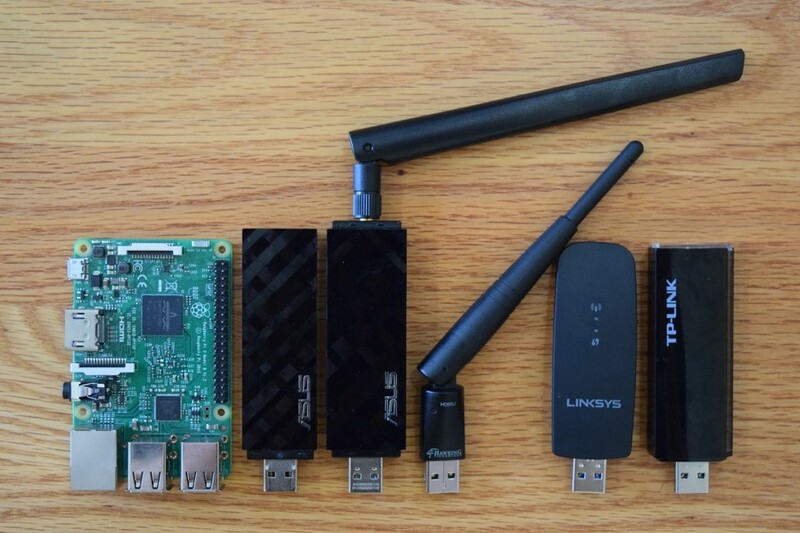 The same utility can be used to test the RPi wireless interface. If we want to expand the comparison and add dual-band and AC wireless capabilities, we still have to use an external WiFi dongle. In the past, I have used the ASUS N53 802.11abgn extensively to add dual-band functionality to the RPi. 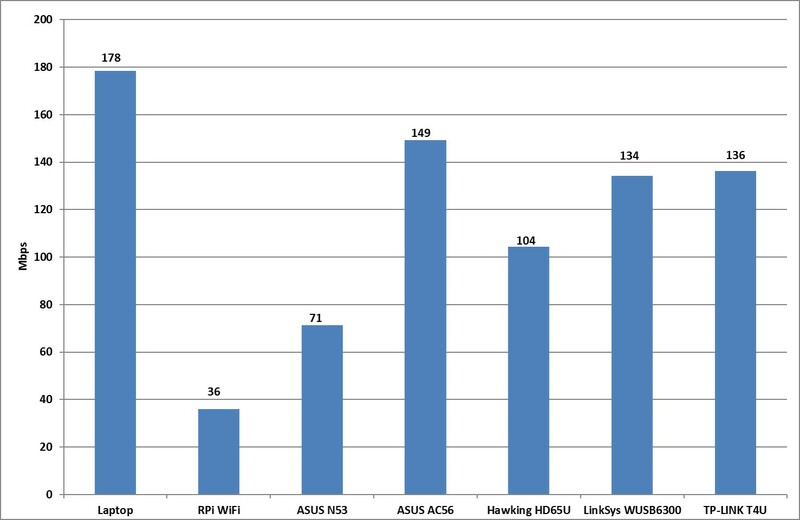 Since the N53 doesn’t support 802.11ac, I also added the ASUS AC56, the Hawking HD56U, the LinkSys WUSB6300, and the TP-LINK T4U to the comparison list. These are only a few of the 802.11ac WiFi dongles that can be found on the market. This is not meant to be an exhaustive comparison of all available WiFi dongles, but a representative sample. The hardware: Raspberry Pi 3, ASUS N53, ASUS AC 56, Hawking HDHD65U, LinkSys WUSB 300, TP-LINK T4U. For the comparison, I used the TP-LINK AC1750 wireless router. The RPi 3 has Debian Jessie with Linux kernel 4.4.9-v7+ #884 installed. Something common among the 802.11ac dongles is that all use the same chipset (Realtek RTL8812AU), which means they also use the same driver. But it’s not supported natively by the RPi. To install the drivers, you can either compile them from source or download them. The ASUS N53 utilizes the Ralink RT3572, which has native support. Individual Iperf test measurements can vary for each run due to network conditions, CPU load and other factors. In order to remove this kind of noise, for each measurement, I ran ten Iperf tests and I averaged the results. In the first test, I wanted to measure the best-case performance when conditions are close to ideal: 15 feet in the line of sight of the router. Below, you can see how the WiFi dongles, as well as the RPi WiFi, perform in terms of Iperf bandwidth achieved for 2.4 GHz and 5.0 GHz. In addition, I measured my laptop’s Iperf performance as a reference which hosts an Intel Dual Band Wireless-AC 8260. In the second benchmark, I wanted to emulate more realistic conditions: 60 feet away from the router and with a couple of walls and electrical appliances in between. After all, there is a reason the ASUS AC56 and Hawking HD65U have these extended antennas. First of all, I was surprised to see that my laptop wasn’t the best performer in either of the two bands. In the 5 GHz band the ASUS AC56 is the clear winner, and in the 2.4 GHz the TP-LINK T4U. Overall, the four 802.11ac dongles and the laptop were the most affected by the distance and obstacles: all of them lost at least half of their performance in the 5 GHz and and close to one third in the 2.4 GHz band. 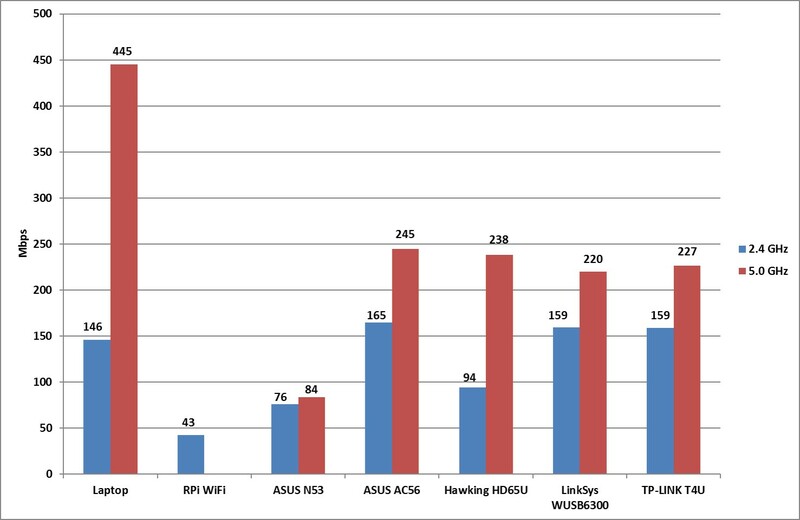 The RPi WiFi and the ASUS N53 were also affected, but not as much. Finally, the Hawking HD65U was the most disappointing one since at the 2.4 GHz did worse than the RPi 3 WiFi, and was second to last in the 5 GHz band. As an overall performance metric, I averaged the four Iperf tests for each platform. It’s not surprising that the laptop is the winner, and that the Raspberry Pi WiFi is the worst performing interface. The ASUS AC56 comes first among all dongles. The LinkSys WUSB6300 and TP-LINK T4U are more or less tied in the second place. Third is the Hawking HD65U and then the ASUS N53. The ASUS AC56 is the most expensive dongle, but also best performing one, especially in the 5 GHz band. The cheapest one is the TP-LINK T4U, which is in second place overall at half the price of the ASUS AC56. Of course, the cheapest solution is the use the onboard Raspberry Pi WiFi if 2.4 GHz is enough for your application. 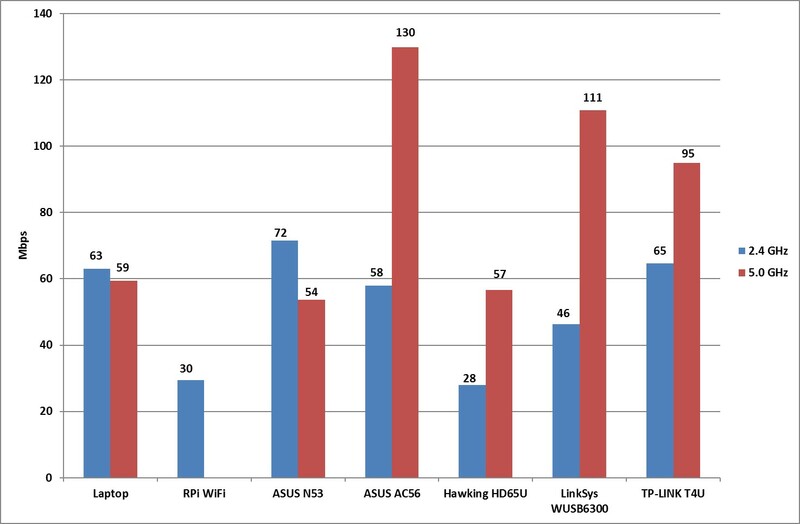 Among the five WiFi dongles I tested in terms of iperf, the ASUS AC56 is the winner in terms of the performance. It also is the most expensive one at $58. The best value for money is the TP-LINK T4U that is have the price of the AC 56 but only 8% worse in performance. In conclusion, there are several 802.11ac WiFi dongles on the market. If bandwidth performance and cost are critical deciding factors for you, I’d recommend doing a similar comparison. If you have done this already, I’d love to hear about your results.